The approach to building an email list to date revolved around inbound marketing strategies. The most popular methods included content upgrade and opt-in forms, which are both quite successful in their own ways. 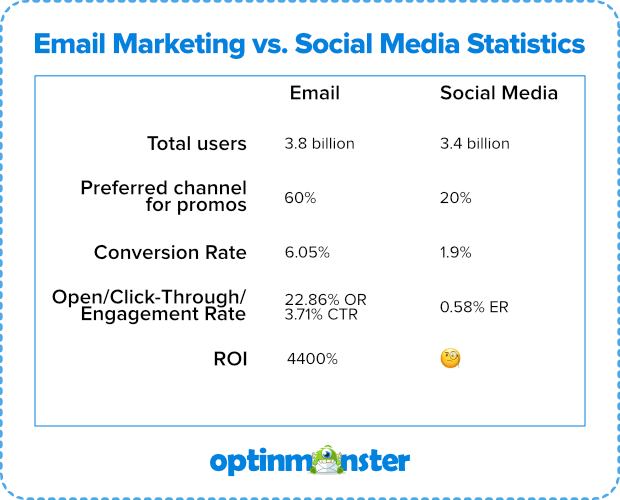 According to this data, email marketing obviously has the upper hand. However, when you don’t channelize the strength of social media, you are losing out on an entire audience, which is audible and visible on that medium alone. 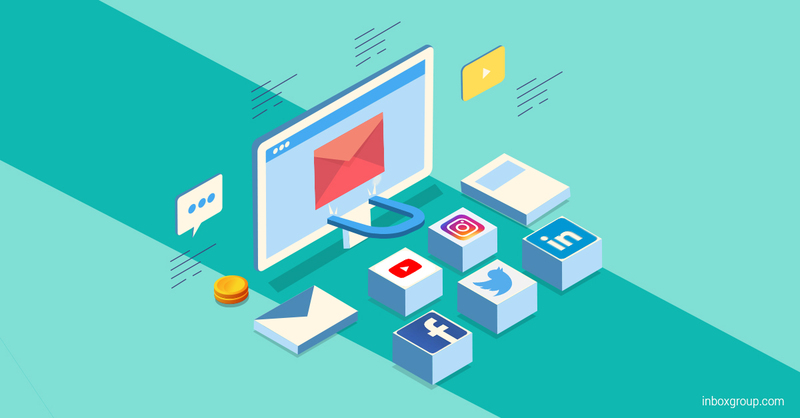 If you want to leverage the social media channels to build your email list, then you need to plan well. No two social media channels work in the same way; hence, you should plan differently to attract the users present on these channels. What is more trustworthy than having someone recommend a brand to you? 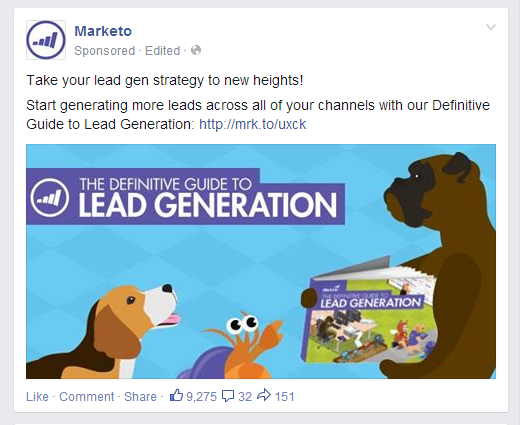 That’s one of the best ways that brands can build their email list using social media. On Facebook, after posting your message or content, make sure you make use of the “share with your network” button. Get more people to share the content with people on their list. This will not only increase your visibility but also get more people on-board. Who wants to miss out on an exciting or exciting Instagram or Snapchat story? Most people would be present on that medium for sure. You can create some interesting stories of the “behind the scenes” for your brand, and get people to view them. At the end of the story, make sure to link your newsletter. The story should give them an idea on what to expect from the website link that you have shared and should compel them to visit the website. Twitter chats are an excellent way to bring on board new people and getting them to use your products/services. Whether they need a question answered or, they want to know about your product, twitter chat helps them connect with you directly. It also helps your brand know new and potential users of your products and services. However, to build your email list via the twitter chats, you need to include the Twitter lead generation cards. This card will collect the email Ids of the potential customers. 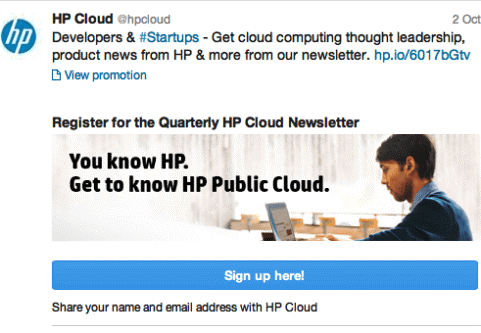 HP Cloud used the Twitter lead generation strategy to get more potential customers on-board. One of the best ways to get people to visit your website and sign up with their email Ids is via promoting gated content. Most of your target audience is present on social media channels. You need to make it look promising and informative for the audience. Once you have their attention, you can quickly get them to visit the website by posting the link. Once on the website, make sure they are not allowed to look into the other parts of the website without downloading the gated content you have just promoted. All you need to do is make your gated content promotion look informative, and not as a sales pitch. Instagram is a medium that you scroll through when you are sitting idle. This is the platform that brands can use to promote their products or services. You can even post the discounts you are offering with the relevant photos. You merely need to link the discounts and the offers with your newsletter. This will get you an assured download for the newsletter, and an email list that you can approach later. A lot of influencers and brands are using this tactic. They make people aware of what to expect in the link, and then post the link either in their bio or the post itself and get people to at least click on it. It is now widely known that people prefer watching videos to reading the text. You need to leverage this fact by creating videos, posting it on your YouTube channel, and providing the link to your website in the description to engage better and get more people to click and sign in. You can add the required call-to-action at the end of the video for better engagement and direct connect. If you are not comfortable adding it to the end of the video, make sure to include it in the description itself. The LinkedIn group is an active place to begin your marketing and promotion. Make sure your conversations in the group don’t come across as a sales pitch. You need to provide information, add to the knowledge the group possesses and answer the questions they probably have about your company. A LinkedIn group requires the right amount of effort from your end. Make sure you have optimized your profile in the group to fit the target audience requirements. You will need to post and share content regularly to nurture this group. You will then need to connect with the people who you believe would be interested in your brand, personally and invite them to be a part of the group. Once the group is active and the people start showing interest, you can get them to exchange their email Ids for some useful content. Social media giveaways or contests are the best ways to get people attracted to your brand’s page and build your email list. For the contest, the hashtag is the most crucial component, as the entire contest’s popularity depends on it. Next, you need a good quality photo of the giveaway that you are planning for this contest. Finally, you need to release the contest itself. 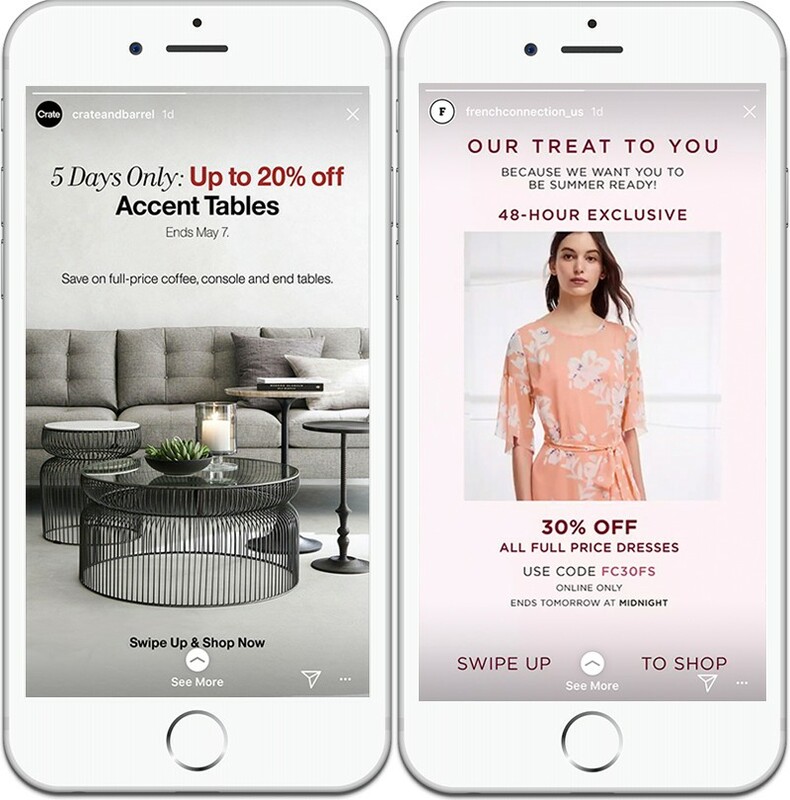 Make sure the content comprises of the hashtag, the picture of the giveaway and a link to the landing page, which will help you get the email addresses. Several social media marketing tools can be used to create the contest and build your email list. The way you use social media determines how valuable an asset it can prove to be to your company. You should remember that every social media channel interacts and works differently. Make sure to understand what works best on which medium, and work on the content for the medium, before releasing the post to the public. Chris sent his first email campaign in 1995. 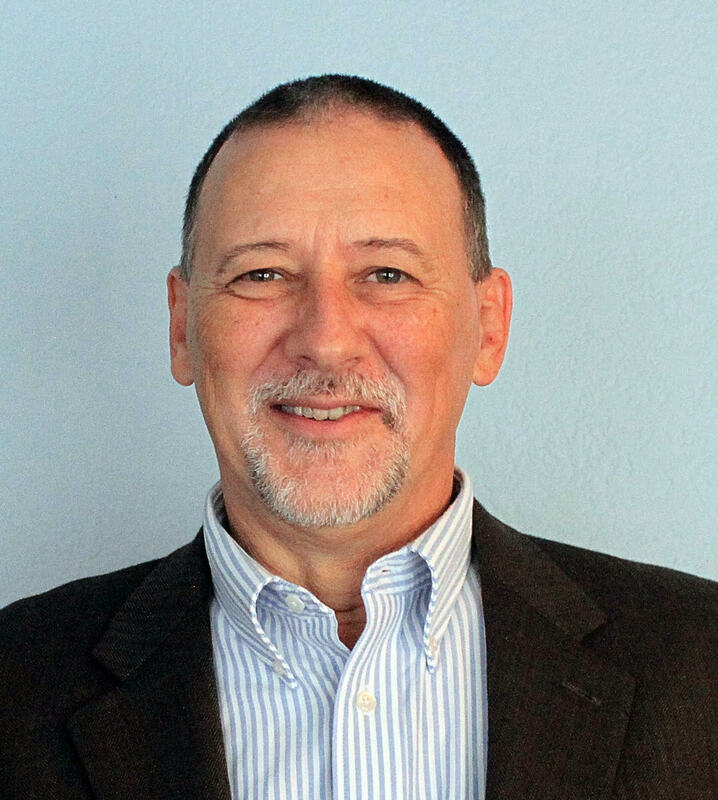 He’s worked directly with Fortune 500 companies, retail giants, nonprofits, SMBs and government agencies in all facets of their email marketing and marketing automation programs. He’s also a BIG baseball fan, loves a good steak, and is mildly obsessed with zombie movies.